As interns, Matt and I have been trying to save costs on all our little excursions. We've been lucky and had friends and family that had contacts out here, but the majority of our excursions have been funded by ourselves. It looks like I might be breaking even this summer, but it was all worth it to experience such a beautiful (and expensive) place. When we decided we wanted to go to Napa the last weekend we looked up deals on sites such as Groupon and Living Social. Many websites for hotels/destinations (aka wineries) have coupons on their own sites too. 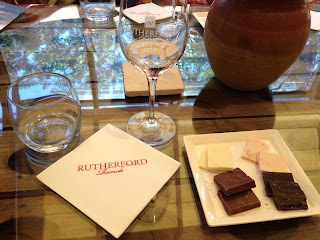 We found a Groupon for a $20 wine and chocolate tasting for two at Rutherford Ranch ($45 value) and had to try it. I'm so glad we did! Rutherford Ranch has a beautiful property of huge olive trees and lots of flowers. The tasting was inside on big comfy couches in front of big windows overlooking the property. We tried 4 different wine + chocolate pairings. 4. Dark chocolate chili pepper with Rhiannon. They were all paired very well. My favorite was the lemon white chocolate with Chardonnay. I'm a big Chard fan and their's was crispy and citrusy. The creaminess of the chocolate made it very smooth. The dark chocolate chili pepper was very different and good too. Matt and I had a great time trying the different chocolates and talking about the different wines while cuddled up on the couches. 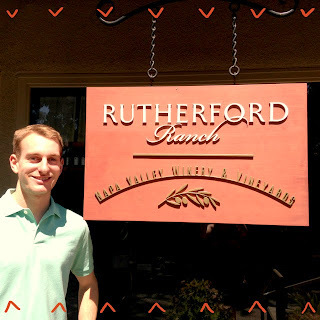 I definitely recommend Rutherford for a unique and delicious experience.